I’m looking to purchase a press and found a Golding Pearl #11 and a C&P 8x10 for sale on craigs. I’m not familiar with the avg price of these presses are, but have seen a wide range on the web. I was wondering what your thoughts are on these presses and if they are priced right. Is in working order, used only for die cutting because owner bought a bigger machine after 4 years. 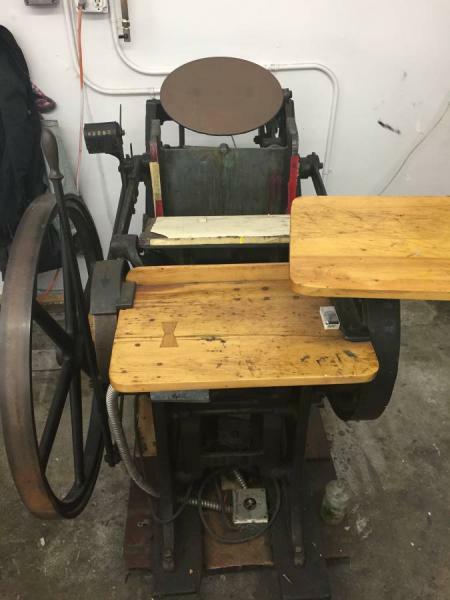 I’m selling all our letterpress equipment. This is the last of it. My wife was using it before we had kids. That was 8 years ago. I’ve had it for about 18 years. Based on the pictures, does everything look good? Where about are you located? My expertise is with the Golding brand,but, without a picture it is impossible to point out any potential problems with that choice. The Pearl is a lighter duty model than the C&P however. One possible concern in the pictures provided is the C&P appears to have a lot of tape on the rails. This could mean the rails are worn. Additionally it may have unevenly worn rails based on the short pieces of tape visible. If true, that would not be a good choice. Thank you for the insight, John. May have to pass on the C&P then. Your website about the Golding brand was a great help in learning about the brand! I’m going to ask for pictures of the Pearl and post afterwards for you to have a look. John is correct that the rails are worn. But all platen press rails will be worn. You can’t be close to 100 years old and not have some milage. 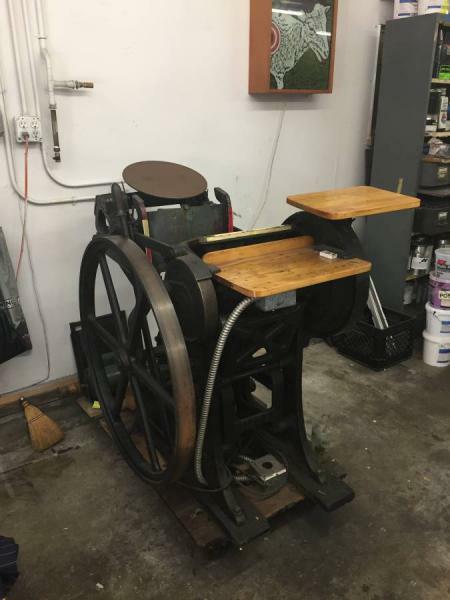 see (https://www.boxcarpress.com/blog/faq_category/platen-press/) I own two C&Ps and have not paid over 1000.00 for either. But that depends on how quickly you want it and what you are going to print. There are a lot of presses out there so depending on your budget, be patient and don’t get discouraged. What are you going to use the press for? 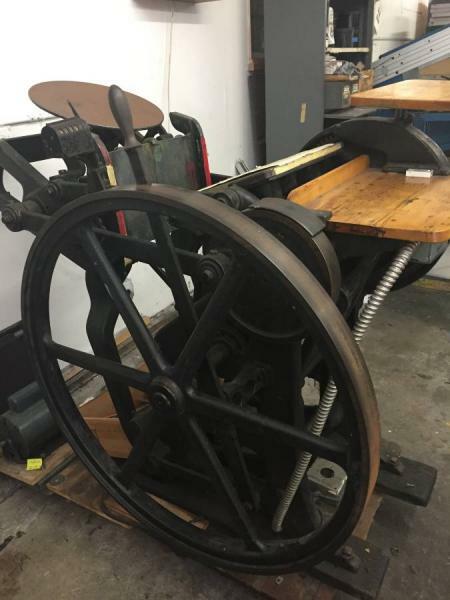 If you are going to print large wood or linoleum blocks, then neither of these presses would be ideal. For that purpose, a cylinder press would be much better. If you are going to print with deep impression, which takes more force than a “kiss” impression, then I wouldn’t consider the Golding. 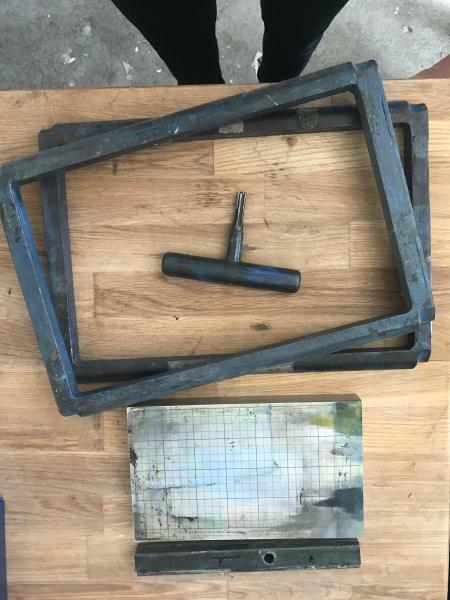 While you might get away with using the Golding, since the press is more lightly built, you might also break it. You should also ask about, and look for, any cracks, breaks or repairs in the cast iron parts of the presses you are considering. The $2000 prices seem high to me as well. I would be surprised if the sellers got that much for them. 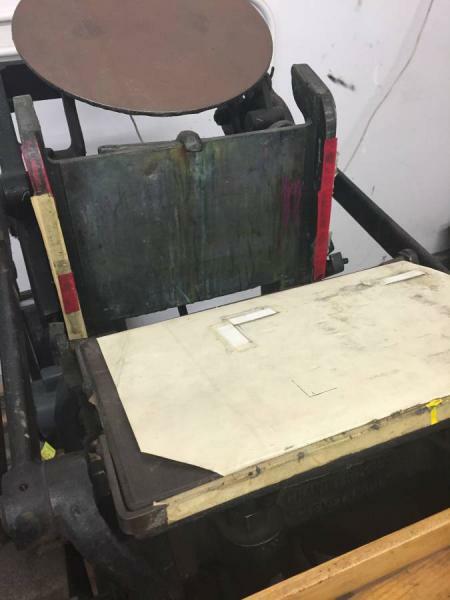 Did you look at the classifieds here on Briar Press? 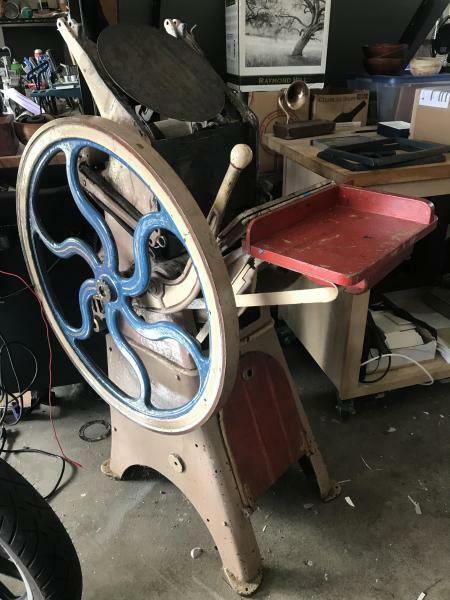 I agree that if you wait until a press in good condition comes up for sale, it will be a lot less hassle to use in the long run. You can get Heidelberg platens aka windmills for under $2000.00 if you look long enough. I would not pay more than $200.00 for what is pictured. Just my opinion though. I plan to print custom stationery, wedding invitations, biz cards, etc. Would that mean the Golding isn’t the right fit? I may have to just be patient keep looking around. Some additional points and clarifications: The comparable Golding to a C&P floor model is a Golding Jobber, not a Golding Pearl. Many people start out with a tabletop or a Pearl and may or may not graduate to a larger press like a Jobber or C&P floor model. In this comparison, it would be a Jobber no. 6, which is the closest in size to this C&P. That said, a Pearl is perfectly suited to the products you intend to print as long as you don’t ask too much from the press. Noticeable impression is easily obtained without risking breakage, just as it is in a small tabletop with a little experimentation with packing, dampening of the paper, and a little care. Stationery and business cards should be no problem. Wedding invitations could be more of an issue if they have large solids which are harder for any platen press. If the invitation is text and line art then it too should not be a problem. Any press will tell you when you are asking too much from it if you pay attention. You cannot be a bull in a china shop. A Pearl no. 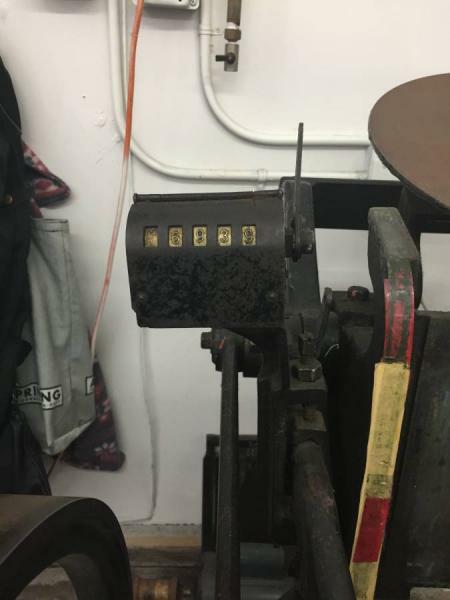 11 is one of the most popular presses precisely because it prints well, is attractive looking, and weighs significantly less than either a C&P or the Golding Jobber. The weight can be further reduced by separating the top and bottom halves when moving. There is not much that is easily done to lessen the weight of the floor models short of complete disassembly. While it is true that most presses have some wear to the rails, there are significant issues dealing with a press with uneven wear. I would not recommend any beginner to get involved with a press with that problem. If the Pearl was used for diecutting, I would have some concern that the platen may have some scoring which could have an effect on your use. Sometimes folks diecutting initially don’t know what damage they might do the iron surfaces. Yes John about lots of poor die cutting damaging presses. But if not for die cutting much letterpress equipment would have been melted down decades ago. A good test of press is “can it kiss cut?” If so pressure/dimension should be good. A lot depends upon where you are located and where you want to put the press. Lots of C&P’s and Kluges available in most areas, but very heavy to move and situate. I’m located in northern California. Finally got back some pictures of the Pearl #11. Thoughts?